The Yeoman Inn originally called “The Waterloo” and then the “Fountain Inn” became “The Yeoman” in 1986. John Holdsworth of Otley, Cordwainer, purchased this property in 1846 and upon his death his daughter, Susannah Renton, was admitted tenant c.1880. In September 1945 the hotel, described as the last remaining ‘free house’ in the town, was sold for £16,000 to Messrs. J. Hey & Co. Ltd. of Northbrook Brewery, Bradford. The sale took place at the Royal White Horse Hotel on 28th September at 4.00 p.m. It was fully licensed and offered with vacant possession. The Fountain was well known to the farming community by reason of its nearness to the Auction Mart. The executors of the late Mr. F. H. Renton, who had died in 1911, sold it. The property had been in the possession of the Renton family for the last 100 years, and one of the executors, Mr. R. T. A. Renton, of Castley, the Councillor for the Otley Division was born there. Mr. Renton had a host of recollections of innkeeping in the old days, when the “Fountain” was what might be described as a “family house.” Those were the days when inns opened at six o’clock in the morning, but at the “Fountain” no-one was served with more than one drink before breakfast. Women were not welcomed in public houses – only when they were accompanied by their husband, and then only if the landlord knew the woman was the man’s legal wife! In the cold weather it was not uncommon for a “warmer” to be provided in the form of boiled or roasted potatoes, with salt. Mr. Renton remembered taking many a Sunday dinner out to a customer who was ill, and recalled the days when, every Saturday, the workmen leaving their employment came into the inn and bought a drink, paying for it with a golden sovereign – to obtain change before going home to their wives! And, believe it or not, beer in those days was twopence a pint, and a whisky was only threepence. After being licensee for 17 years, Mrs. Jean Kirkham retired in 1985 when the owners took the opportunity to make alterations to the building which included the removal of the porch at the front and demolition of an extension to the rear. The latter revealed two lintels made of slanting stonework which were in line with those on the pub frontage which appeared to indicate that in its earlier years there had been an archway through the middle of the property leading to the rear stables. 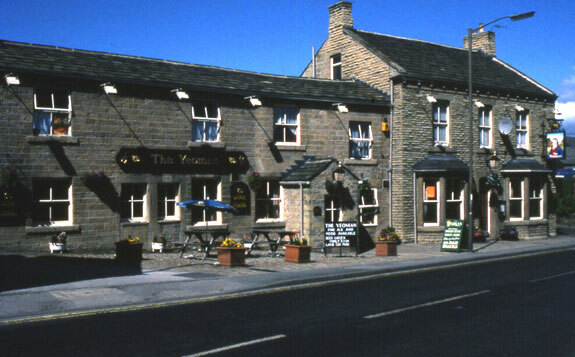 It was re-opened as The Yeoman in October 1986. The Samuel Webster pub, which for a number of years had lain empty, now flourished amidst a wealth of interest, generated by a comprehensive refurbishment. It boasted two luxurious bars, one the Chevin bar, which was decorated in a traditional lounge style, and the other called the Fountain Room, named after the old pub which once, allegedly, had an actual fountain situated within it. The Pub was leased to Hopleaf Inns Ltd. which was a company owned by Jim Wilson who for many years held a senior position in the brewing industry. It suddenly closed its doors in November 2009 and has been closed ever since and is advertised to let by Dacres Commercial. In 2012 the owner is thought to be George Tate of Tate Fuel Oils.